Our Certified Florists can create the perfect gift for any occasion. Tops Floral is the place to go for all your holiday needs, special events, graduations, weddings ... any special occasion. 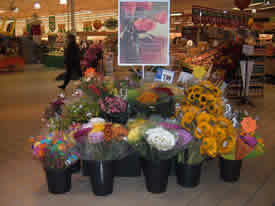 You'll find a large variety of beautiful and fragrant mixed bunches and fresh cut bouquets at Tops. Or, if you're feeling creative, you can treat yourself or a friend with a beautiful bouquet designed by you! Mix and match from our stunning selection of fresh flowers to create your own personalized combination. A custom arrangement will be great for your home decor or to express your feelings to a friend or loved one. Seasonal varieties are also available. Cant decide on what to give? Let our Florist design that gift for you. Our Florist can create the perfect gift in special colors and flowers of the season. Petal Works at your local TOPS offers a large variety of indoor and outdoor plants that are perfect for your home and garden! Houseplants in decorative pots will liven up any room and bring a bit of the outdoors inside. Our wide selection of outdoor plants gives you plenty of options when planting your flower beds and outdoor arrangements. Our plants are shipped to our store daily from all over the country as well as from local growers. Gift items are also available.